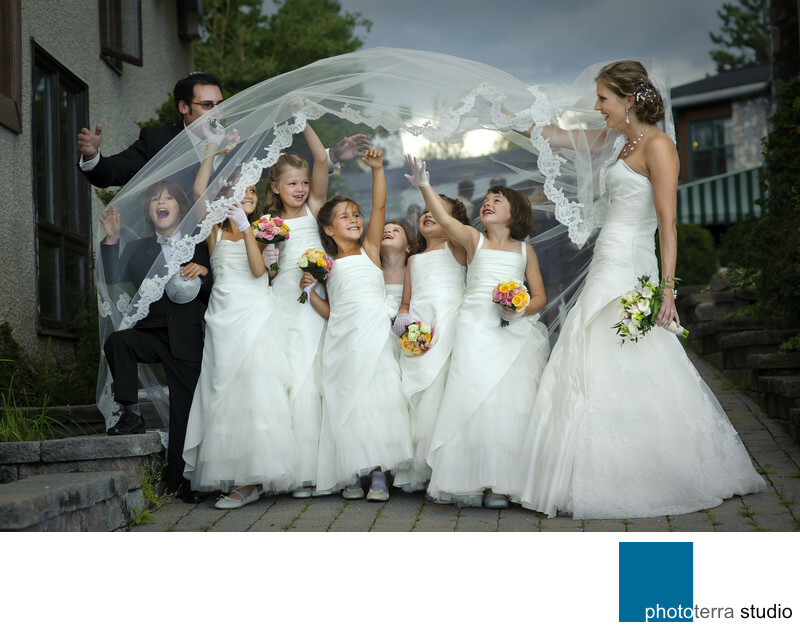 This Jewish wedding took place in the beautiful Laurentian Mountains of Quebec, near the town of Sainte-Agathe-des-Monts. It is rare that we see so many children in a bridal party. There are usually 2 or 3 flower girls and a ring bearer. Here we have 7 of them! Our bride is the aunt to them all. The kids brought magic and infinite energy to the wedding, despite the thunderstorm and the heavy rain that followed. It rained sporadically throughout the day in patches. The sun was desperately trying to break through the darkening clouds, but it soon became apparent who will win this battle. We were lucky in a sense because the ceremony and reception were at the same location. Free to move in and out of the venue we’d grab our couple and run outside for photos every time the rain would stop. Our eagerness to steal some sunshine and capture the drama in the sky ignited the kid's curiosity, who saw us rush outside, so they followed. With everyone happy to be in the picture, this was a natural composition. What made it even more exciting was the strong gust of wind that lifted the veil in the air and created the magical moment you see on this photograph. As the veil flew higher, the children got happier and so did everyone else.